"Born into poverty. Destined for stardom. He lived the American dream." 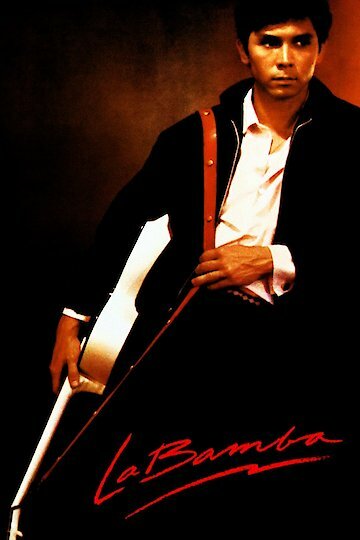 La Bamba is based on the true-life tale of Richard Steven Valenzuela who performs as a rock superstar as Ritchie Valens (Lou Diamond Phillips). Ritchie falls in love with Donna Ludwig, a high school sweetheart. Donna’s father doesn’t like the fact that his daughter is dating Valens because of his Hispanic-American heritage. The couple breaks up due to the racist father, leaving Ritchie in a lovesick pain. Valens has a good relationship with his mother and a love-hate relationship with his brother, Bob. Bob shows jealousy toward Ritchie. Bob had a child with Ritchie’s first girlfriend, Rosie and this too causes problems between the two brothers. Ritchie writes his first song, “La Bamba,” when he and his brother take a road trip to a nightclub in Tijuana. The song wasn’t an immediate hit but the road trip and nightclub brought it to fruition later. Ritchie has a fear of flying. His fear is created by two planes that crashed together over his school and Ritchie’s best friend was crushed underneath one of the planes that crashed to the ground. Ritchie happened to be away at his grandfather’s funeral that day and it could be implied that it may have been a result of guilt for not being there for his friend. Valens has to overcome his fear of flying as his music grows in popularity. “Donna,” his first hit song, was to be performed on American Bandstand, which meant a flight was in order. His manager, Bob Keane, supplies him with some vodka to calm his nerves for his appearance on Bandstand, in Philadelphia. As his songs become better known, Ritchie is asked to travel with Buddy Holly and The Big Bopper to a Winter Party Dance Tour. Valens, Buddy Holly and the Bopper load their things on to a plane on February 3, 1959 for the tour. Valens’ brother receives a phone call from Ritchie, right before the plane crashes in the snowstorm. He had invited Bob out to Chicago to join him on the tour. La Bamba is currently available to watch and stream, download, buy on demand at Amazon Prime, Amazon, Vudu, Google Play, iTunes, YouTube VOD online.